Ketogenic diet has become so popular that it drew my attention recently. Just like Atkins diet, it is a low carb diet, but a unique thing about the Keto diet is the fact that it is a high fat, moderate protein diet. If Keto diet is followed, fat turns into Ketones and body gets energy from Ketones, instead of Glucose. The body gets into a state called Ketosis where it burns fat and helps to lose weight rapidly. Anything that gives the end result “weight loss” sounds good to a foodie like me! But honestly, I could never follow any particular diet. I can reduce and manage portion, I can exercise moderately, but following any strict regime is difficult for me. Additionally eating high fat? All my cooking life, I have tried to cook with less oil/ ghee/ butter and I always avoided food with high fat content. So I may not be able to digest high fat! I have all these fears and doubts about starting with Keto diet. But I cannot ignore the enticing end result – “rapid weight loss”. So I want to give it a try and the motivating factor for me would be coming up with yummy Keto recipes. So here is the first recipe that I tried. “Sarson ka saag” is a delicacy from the province of Punjab in India and Pakistan. It is served with “Makki di Roti”, flat breads made out of corn flour. Sarson (Mustard) ka Saag (Leaves) is made with the combination of three leaves – Mustard leaf, Spinach and Bathua leaf. However, I could manage to find only the Mustard leaf and spinach leaf from the nearby grocery stores. So this recipe is a little bit modification of the authentic “Sarson ka saag”. Sarson ka saag is made best with lots of ghee and whipping cream that will help me meet the fat requirement for my Keto diet. 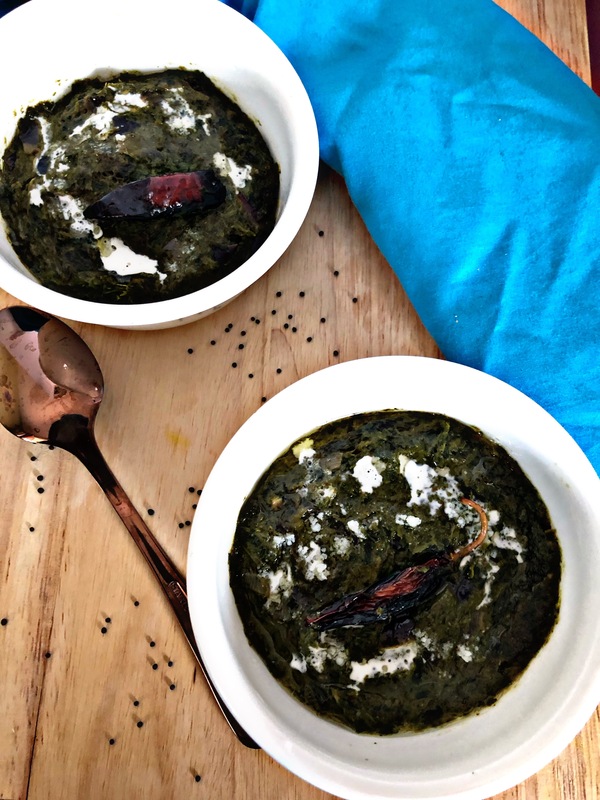 So here is the recipe for a flavorful and delicious “Sarson ka saag” which helped me to start my Keto journey. I hope that this enticing vegetarian Keto recipe helps you to embark on a Ketogenic journey! Heat a pan and add the leaves. Cook the leaves for 4 to 5 minutes until it shrinks and becomes soft. Add the paste of the leaves and mix it with the spices. Bathua saag, radish leaves, fenugreek leaves can be added with mustard and spinach leaf.